This card ended up at a York car boot sale. This is perhaps its only connection to the city, though it probably has connections to a Yorkshire family. I’m sorry about the ‘perhaps’ and ‘probably’, but it’s the best I can do. It was in a box of photo albums and old postcards collected by my mother, bought in recent years, and passed on to me. There are several separate family histories in the box. Over the years, while passing through various hands, the histories have become disjointed and jumbled. Once I paid proper attention to this rather overwhelming box of other people’s most precious things, I realised that this card probably dated from the First World War. Again, the power of the internet delivered the answer in seconds, as I found similar examples. Links are below. 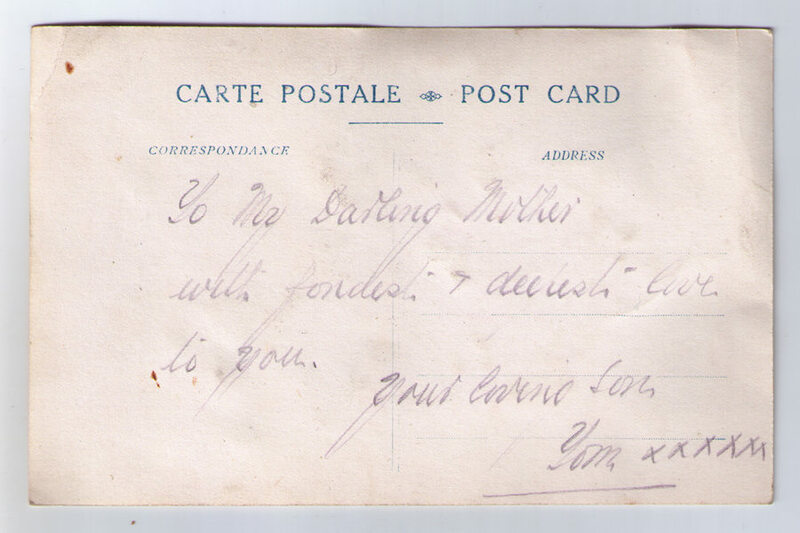 This card has arrived with me, via so many hands, around 100 years after it was sent. I wish you could all see it, handle it, in real life too, but the next best thing is this digital version. It’s a postcard, with a velvet flower and leaves stuck on to it, in between printed lettering. Many of these cards were made, and there are many variations. Some are beautifully elaborate. This seems to be one of the more simple designs. Underneath the flower, in gold print: ‘Gathered for you’. The printed version wasn’t personal enough – ‘My Mother’ is added underneath, underlined, in now very faded ink. How much desperate love can a boy/man convey on a postcard. I assume – as it doesn’t include an address – that the card must have had an envelope. Tom perhaps came home. But maybe not. Maybe the ‘Flowers of France’ were the last ones he saw. Though of course we’re not living a century ago and absorbing this comforting propaganda, and we know that it’s more likely that poor Tom was wading around in the mud of the battlefields with not a flower in sight. This card must have been cherished and carefully kept for the best part of a century. I don’t know how it got to York. I imagine if someone dies and no family survive them, or if the family who are connected to the deceased aren’t interested in boxes of old photos and papers, then such things end up being sold on or given away. Tom’s card was with a bundle of other papers, at a car boot sale, where thoughtful people like my mum rescue lost photos and postcards and documents. Sometimes these lost photos and other printed documents have part of their history returned to them, through internet-based research and with the help of web-based communities. Occasionally they may be returned to the family, to a descendant. I’ve not got much to go on here, with Tom. His heartfelt message home won’t be returned to a descendant, because he could be any Tom … any Tommy, you might say. 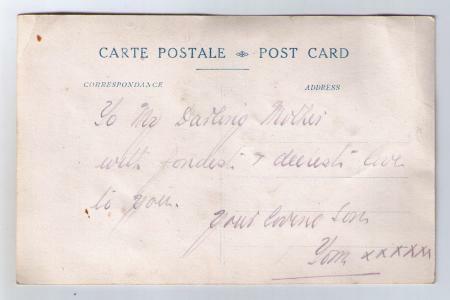 So I thought I should share Tom’s card to his mother, before that heartfelt message with its six kisses fades entirely. By Lisa @YorkStories • 13 April 2012 First World War, Histories To link to this page's proper location please use the > permalink. This is such a touching story. The Regimental Museum next door to the Hilton in York may be able to help on tracking this down. Thank you Graeme. As we don’t have a last name, and no other information other than what’s shown above, I don’t think research can be taken any further, sadly. I don’t mind – I’m seeing Tom as standing for all the ‘Tommies’ – as an unknown soldier. I have an embroidered post card, carefully wrapped in tissue paper, similar to the one on the internet. 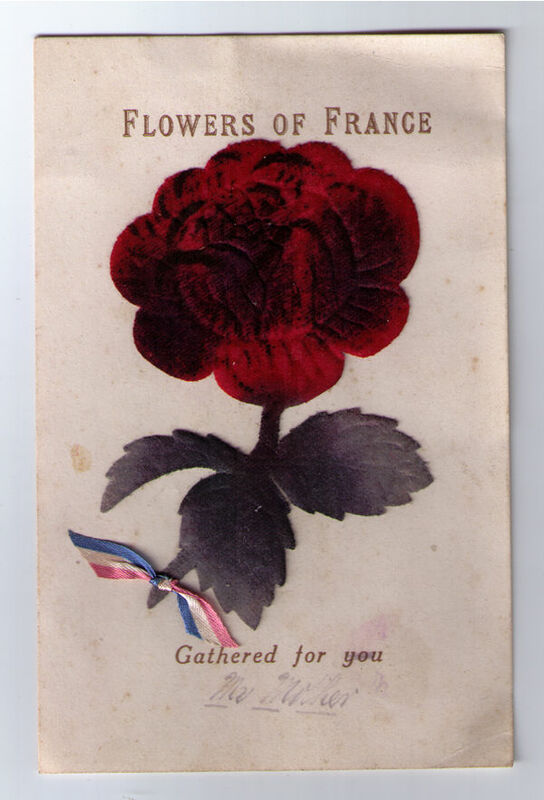 I also have a collection of postcards from WW1 sent by my paternal grandfather from Belgium to my grandmother and father. Elizabeth – it’s nice to hear that other cards from the time are being carefully kept, and that yours have stayed with the family. What a wonderful thing to have.